Eutrophication is an increase in the concentration of nutrients (primarily nitrogen and phosphorus) in an ecosystem to the extent that an excessive increase in primary productivity occurs. It is most often the result of anthropogenic pollution, particularly the release of sewage effluent and agricultural run-off carrying fertilizers into natural waters. Eutrophication generally promotes excessive plant growth and decay, favours simple algae and plankton over other more complicated plants, and causes a severe reduction in water quality. It can lead to dense blooms of phytoplankton, including “red tides” or harmful algal blooms, and changes in seagrass beds and other submerged aquatic vegetation. It also increases zooplankton productivity, and causes changes in coral reefs. Negative effects include: decreased water clarity; depletion of dissolved oxygen in the water; reductions in fish and shellfish harvests; fish kills; problems with water odour; and decreases in the resource value of coastal and marine habitats such that recreation, fishing, hunting, and aesthetic enjoyment are hindered. Eutrophication is a common phenomenon in marine and coastal waters. Nitrogen is more commonly the key limiting nutrient of marine waters and is of greater importance in marine waters than phosphorus. Estuaries tend to be naturally eutrophic (nutrient rich) because land-derived nutrients are concentrated where run-off enters the marine environment. 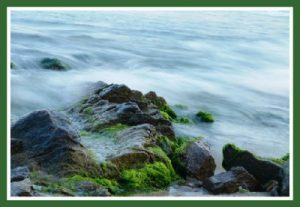 Upwelling in coastal systems also promotes increased productivity by conveying deep, nutrient-rich waters to the surface, where the nutrients can be taken up by algae. The National Estuarine Eutrophication Assessment has shown that nutrient-related water quality problems are observed in 60% of US estuaries. The nutrients of most concern in the Gulf of Maine are nitrogen, phosphorus, and carbon. About 91% of nitrogen into the Gulf of Maine is from waste water treatment plants, and 9% from industries (half of that from pulp and paper operations). Eighty per cent of all the point sources lie within four watersheds: Massachusetts Bay and Sheepscot Bay ME and the Saint John and Merrimack rivers. In November 2001, the Gulf of Maine Council together with the Cooperative Institute for Coastal and Estuarine Environmental Technology (CICEET) held a workshop in Portsmouth, NH on Managing Nitrogen Impacts in the Gulf of Maine. The purpose of the workshop was to review issues related to the management of nitrogen contamination and its impacts in the Gulf of Maine and the surrounding estuaries and embayments. In addition to the Actions and Responses described in each theme paper, many different organizations have developed guidelines, codes of conduct, best management practices, or other types of advice aimed at addressing the issues described in the theme papers. Some of the guidelines related to Eutrophication can be found here. These links are maintained by outside agencies and are provided for information purposes. The linked documents are not endorsed by the Gulf of Maine Council on the Marine Environment.